Windows OS Hub / Windows 10 / How to Inject Drivers into a Windows 10 WIM/ISO Install Image? How to Inject Drivers into a Windows 10 WIM/ISO Install Image? In this article, we will show you how to add the necessary device drivers directly into the Windows installation image. The integration of the device drivers into your offline Windows image is widely used when you need to deploy a large number of workstations and servers on the same hardware. Instead of manually installing specific drivers (including AHCI/ RAID/ NVMe) on each device, you can significantly simplify and accelerate OS deployment process by integrating the drivers directly into the Driver Store of the Windows installation image in the ISO/WIM or the VHD/VHDX file. When installing such an image, the Plug and Play service (PnP) will automatically install the necessary drivers for the detected hardware. This manual is about the integration of device drivers into a Windows image and can be used both on desktop editions of Windows 10, Windows 8.1 and on Windows Server 2016, 2012 R2. In fact, both techniques perform the same operation: add additional drivers into the offline Windows image. How to use it is a matter of personal administrator preference. Let us consider in more detail both ways on the example of integrating drivers into the Windows 10 installation image. Note. In Windows Server 2008 R2 and Windows 7, it was possible to add a driver to the Windows installation image using the imagex command line tool (included into the WAIK), but it is not supported in Windows Server 2012 and later. How to Inject Driver into a Windows 10 Install Image using PowerShell? First of all you need to download and place all the necessary device drivers in one directory (for each driver you need to create a separate folder). Please note that many vendors (including Dell, HP) supply their drivers in the form of self-extracting exe or zip archive files. Such archives must be unpacked to local drive so that the directory with drivers contains inf, cat and sys files. You can download and unpack the necessary driver files manually or export all third-party drivers from a reference Windows 10 computer, on which all the necessary drivers are already installed (using the Export-WindowsDriver cmdlet). The Mount folder – an empty directory into which the Windows install WIM image will be mounted later. List all Windows editions contained in the Install.wim file using the Get-WindowsImage PowerShell cmdlet. This is necessary in order to specify the Widows edition into which it is planned to integrate the additional drivers. In our example, the WIM file contains only one Windows 10 Pro edition with the index 1 (ImageIndex: 1). The Add-WindowsDriver cmdlet will recursively search (the -Recurse parameter) the specified folder for all *.inf files with driver description. According to the description in the inf file, the cmdlet will add the dependent INF, DLL, CAT, PNF, etc. files to the Driver Store of your Windows image. Using the –ForceUnsigned key, you can add to the driver store even an unsigned drivers. Otherwise, you will have to disable the digital signature enforcement or sign the device driver yourself with a self-signed certificate. In the above example, we added drivers to the Install.wim image file. This is the Windows image that will be deployed to a computer local disk. If you need to add drivers to a Windows boot image (from which the computer boots when you install Windows), you need to add drivers to the Boot.wim file. This is usually necessary when installing Windows, the computer doesn’t detect local hard drives or doesn’t connect to LAN. Usually, only drivers of disk controllers and network adapters need to be integrated into the boot.wim image. 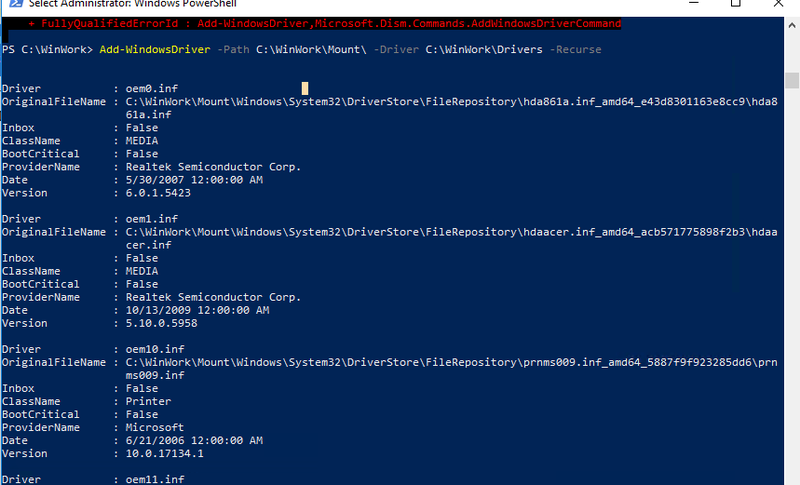 Please note that over time, the driver store folder (%WINDIR%\System32\DriverStore\FileRepository) can grow significantly, so you need to remove unused and old driver versions from driver store periodically. There is no Add-WindowsDriver cmdlet in Windows 7 / 2008R2. It appeared only in Windows 8/ Windows Server 2012 and later, therefore to integrate drivers into an image of Win7/2008 R2, use the DISM tool (see the example below or in the article Adding the USB 3.0 Drivers In Windows 7 Installation). 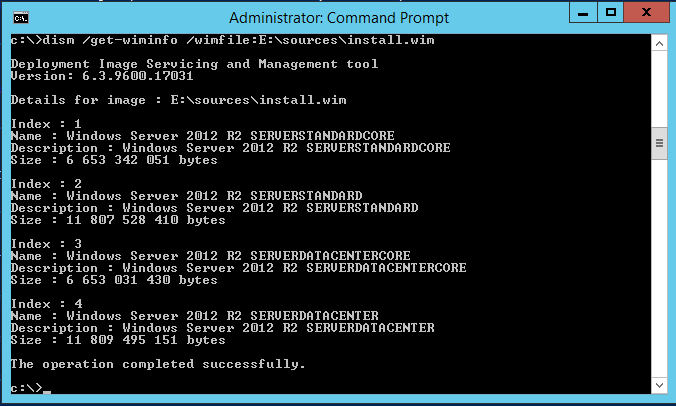 Now we will show an example of integrating drivers into the install image of Windows Server 2012 R2. If you are building an image on Windows 8.1, you will need to download and install Windows 8 ADK (http://www.microsoft.com/en-us/download/details.aspx?id=30652) to continue working with the latest version of DISM. You need to install the Deployment Tools component. 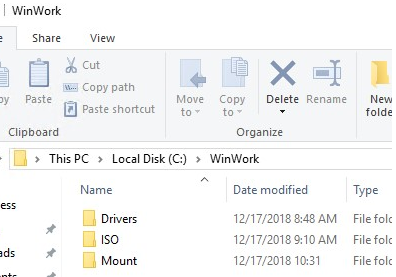 Use the same directory structure: Drivers (drivers and *.inf files are stored), ISO (unpacked image of Windows Server 2012 R2), Mount (image mount directory). It is assumed that in the install.wim file we are interested in the Windows Server 2012 R2 Datacenter edition with index 3. You may also have to integrate drivers for network adapters and disk controllers into the boot image file boot.wim. In addition to driver integration, it is usually necessary to inject security updates to the Windows image to be installed (How to add updates into the Windows installation image). This will increase the security of your OS immediately after the installation. It remains to write the resulting installation image to the DVD disk or USB flash drive or convert it to the ISO image.